Puppies in the shredding stage aren't ideal candidates for soft-sided crates. When it comes to road-tripping with your pup and storing his crate, soft-sided dog crates can make your life easier. On the other hand, they can make your life miserable if your pal isn't potty trained or if he's a naughty canine who believes his crate is a chew toy. A soft doggy crate won't have you slamming and shifting things around in an attempt to store it in your closet, under the bed or elsewhere. The soft crates break down easily and you can squish them between just about anything when it comes time to moving them off your floor. Some have a wire frame that enables you to fold the crate into a flat square or rectangle. Some go further and enable you to twist the frame and fold it over itself to compress the crate even more. Other crates require you to remove or disengage steel bars that serve as the frame and then push in both ends to flatten the crate for easy storage. In contrast, a plastic crate is one rigid structure. Most wire crates collapse into a flat shape, but you're still left with one large piece of stiff metal. Soft-sided crates are not the best choice for canines who aren't yet house trained. Cleaning pee and poop off of fabric is, as you might know from previous accidents, not enjoyable. Cleaning the mess from a plastic or wire crate requires less time and effort. Even for older dogs who are house trained, you still need to clean the crate occasionally to remove that nasty dog stench, the slobber marks and the hair that builds up. That means throwing it in the washer, or for the nonwashable types, a bunch of elbow grease. As you can probably imagine, fitting a heavy wire crate into your car is no small task, especially if you have a tiny vehicle. Plastic crates are slightly easier, if only because they're lighter and easier to maneuver, but even they don't hold a candle to the transport wizards that are soft-sided crates. With a soft-sided crate, you don't need to worry about dinging your door, you won't break a sweat lifting it in and out of your car and it's generally easier to maneuver along your seat and fit it between people or items. As far as soft-sided crates are concerned, steel-framed ones offer the best safety for your pup in case of an accident. Some dogs aren't fond of their crates. Instead of relaxing and sleeping, they think of the crate as their No. 1 enemy and attempt to rip it into pieces. Soft crates offer nothing against the strong jaws of your pooch. He can render it useless while you're away from the house or not keeping an eye on him. While your pup can hurt himself by trying to destroy bare plastic or wire crates, you can pad those types of crates and still keep him safe inside. There's not a whole lot you can do to prevent him from tearing apart a soft-sided crate. Note that even steel-framed soft-sided crates do not prevent your pup from destroying the crate. While not a major advantage over other crates, soft-sided crates often come with side, front and back flaps that you can open and close. They appease pups who enjoy looking out of their crate and those who prefer to be more enclosed. You can enclose wire and plastic crates by draping a towel over them, but that's not particularly pleasing to the eye. Can You Put a Cat in a Crate at Night? 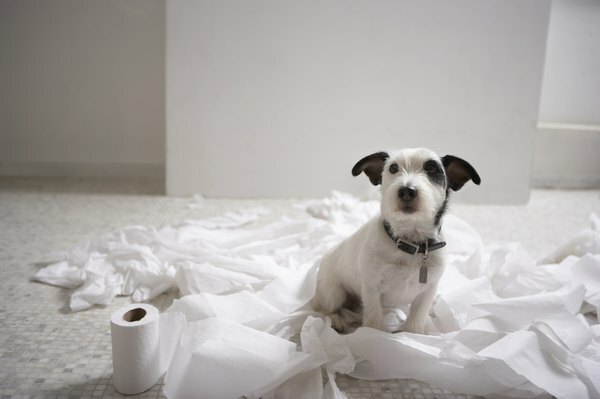 Should You Put Pee Pads in a Dog's Crate?